We have shown under "Chr�tien" that the French poet invented grail romance in the 12th century and introduced graal as the hidden key to his sources. According to Coromines, du Cange, et al. the word is derived from gradalis, a simple bowl or service dish, not a holy chalice. They identify the earliest use of gradal in Urgell (Spain) in documents (1010-1030 CE) of descendants of Guifr� el Pel�s, who is celebrated as the founding father of Catalonia. This localization is also supported by independent evidence: Nine Romanesque churches with paintings of fiery grails were discovered in the Pyrenees above Urgell, which Chandler R. Post (1930), Otto Demus (1968), Christopher Dodwell (1993), and Joseph Goering (2005) connect directly to the grail mystery. Because they were painted half a century before Chr�tien coined the word, he seems to have been inspired by Catalonia and its history, and if this conjecture is valid it should be confirmed by other allegories in the poem. According to Chr�tien de Troyes, the Magic Sword is covered by a scabbard of ornate Venetian gold brocade and its hilt is decorated with Greek or Arabian ornaments. The "or" is an interesting ambiguity because Perceval receives the sword at the grail castle just before the virgin enters with a grail that emits so much light that all candlelight "fades like the stars when Sun or Moon are rising". This validates both options and relates to the macrocosm, because the maiden behind her carries a silver plate to add the moon. We had followed the Arabesques to St Miquel de Cuix�, a monastery below the Pyrenees where the Mozarabic style is preserved by horseshoe arches, and found the Gesta comitum Barcinonensium, a chronicle with forged claims about Guifr� el Pel�s, which Chr�tien corrects with the help of the count of Flanders. Because his poem ends before he can develop his cosmic concept, we turned to the adaptation of Wolfram von Eschenbach where the Greek and Arabian sources are clearly stated. He features Hesiod's phoenix myth, according to Plutarch, and an Arabian manuscript about planets and constellations, which reveals "hidden mysteries" of the grail. According to Wolfram, his informant "the wise master Kyot" searched for a family worthy of the grail in Latin books, and only after he had read the chronicles of many lands did he discover the whole truth in "Anschouwe," which most scholars interpret today as Anjou . The chronicle of St Pere is as important as St Miquel to cover the ornaments of the sword's hilt, but the symbolism of its Venetian scabbard refers to the prologue were Chr�tien praises Count Philip as worth more than Alexander, "of whom so many good things are said, but who was really vicious and evil" . Because he reveals nothing else about the man, scholars ignore the religious context of Chr�tien's prologue and identify Alexander the Great, who was also known for deplorable deeds. However, it would make more sense if a sophisticated poet uses a religious ambiguity, as themed in the prologue, and have his audience pick pope Alexander III "the great" who had just died! We'll show with the legends of Montserrat that the scabbard symbolizes a cover-up after the "Peace of Venice" in 1177. Hence, the Greek ornaments on the hilt could be a clue to the Holy Grail itself. But are we this close to a major discovery? It helps that Chr�tien shows us where to look for another forged chronicle and that this writer spent the best years of his life there. It's from the Eastern Pyrenees where the ruins of Greek settlements mass like the virgins of Urgell, or like the planets we track with Kepler. The map (below) shows part of the Alt Empord� during the era of count Hugo I (991-1040 CE), when gradal was first recorded in Urgell. The Caput Crucis (Cape of Crosses) on the map is about a hundred miles from Urgell and at the North-Eastern tip of the Iberian peninsula where the Pyrenees meet the Mediterranean! You might ask how Latin names can help us with a Greek connection? It's quite kosher, really, because it's a Venetian cover-up and an Arabian key led to the first Latin chronicle. We're in a pluralistic environment! When the Moors invaded from the South and the Franks attacked from the North, the Catalans gave refuge to the persecuted! But that's inside information for later when we deal with Bara the Traitor and Guillem de Gellone. For now, the Latin names are important because the Greek origins are still recognizable. (Click on the map for a larger size and note the large lagoon!) There is even an ancient harbor with ruins of the Greek town Impurias (Emp�ries today) a few miles down the coast, at the bottom of the map at left where the Greeks had their first colonies in the 7th century BCE. 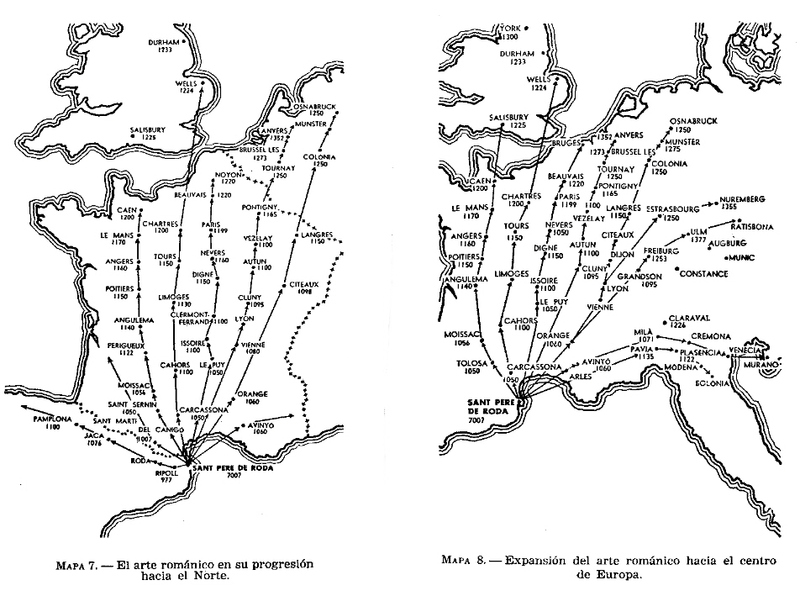 The Romans used Emp�ries in 218 BCE to launch their conquest of the Iberian Peninsula, which Ceasar Augustus completed two hundred years later. To get a better idea of the location you can take a virtual ride on a Paraglider to enjoy the map from the air! After 5 minutes, the pilot approaches the Cape of Crosses and the Catalan narrator introduces at 5:45 the monastery as "Monsalvat where the grail was guarded according its legends"! In addition to this surprise, the flight is a great exercise to prepare for a ride with the fabulous phoenix, which will follow on a higher level of our quest! Master Chr�tien taught us with graal how important etymologies are, and here is a refresher with names like Rhodes, Rodes, Rotas, and Roses that all derive from the Greek Ρόδος, R�dos. At the bottom of the cape is Rotas, facing South, which is named "Roses" today and by far the largest town. The fleet of large and noisy fishing boats that leave the harbor every morning is impressive! Facing North on the map is Armi Rodas, a Greek settlement which is "Port de la Selva" today, once a natural harbor and now a marina and popular tourist destination like nearby Lanciano (Llanc�). Villa Judaica is "Vilaju�ga" today � but the Jewish history of this little village has apparently been deleted. A paved road winds from there into the mountains and ends at about 600 meters (2000 feet) at Sancti Petri Rotas, today "Sant Pere de Rodes" in Catalan, an abandoned Benedictine monastery which has been partially restored . A little higher, on the crest of the mountain, are the ruins of the fortress Castrum Virdaria, of Latin roots, called "San Salvador" today. We should interject that this unobstructed view was taken from the road along the coast, yet none of this was visible before the sixteenth century, when the green mountain was covered by a dense rain forest. The narrow trail from the monastery to the fortress is worth the climb today because the 360 degree views are breathtaking and match Wolfram's descriptions of Klingsohr's castle! 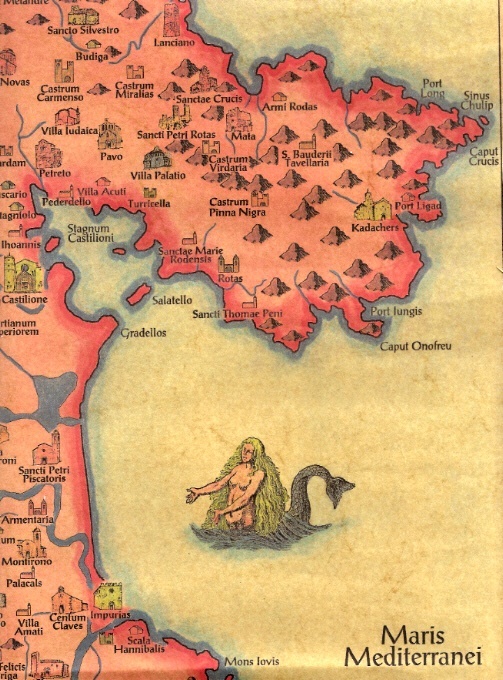 Far below, on the coast, is Stagnum Castilioni, which turned into an enclosed lake (see above map) over time and to which the monastery had the fishing rights. It slowly turned into a swamp and the swarms of mosquitoes used to ruin the summer vacation of the German tourists who controlled the region after WW II. Their aggressive use of insecticides got rid of most birds as well, but the ecology has finally regained its equilibrium � even the tourism became international! The hinterland is mostly agriculture, olive groves, and vineyards. Along the pristine, sandy beaches of the Gulf of Roses line up several villages, campgrounds, and tourist centers. Noteworthy is "Sant Pere Pescador", but the largest is "Empuriabrava" with a fancy marina that replaced the swamp, a private airport, high-rise buildings, hotels, villas, shopping centers, and all kinds of restaurants. und niht von ein ander g�n. Our literal translation destroys the poetic beauty of lines 14-20, but the meaning is preserved. The adaptation of Hatto  misses the point with the Antarctic Pole stands opposite the North Star. It weakens Wolfram's dynamic opposition and reference to Catalonia. Not to be confused with the Ultramontane, the Tramuntana is an icey wind from the Northern mountains that attacks the warm South, and is only known at the Mediterranean. That it is featured in a love letter to symbolize the force of love localizes the grail castle, because of Venus-Aphrodite, as we will show below. Furthermore, it confirms that Wolfram supports Chr�tien's etymological concept by identifying Catalonia: He names the grail castle Munsalvaesche (also Monsalvasch, Montsalwatsche), located in Terre de Salvaesche. These neutral zones were known as Salvaterre, and a part of the Alt Empord� was an ancient refuge. Locations like Selva de Mar, Port de la Selva and San Salvador are derived from Latin like the Old French "Salvage", "Salvatje" or "Salvatge" in Catalan, meaning both, sauvage (wild) and salvation. Mont Verdera (Viridarium) means green mountain, and may be why Wolfram's virgin carries the grail on a green pillow. "Mun" is Catalan vernacular for mountain, and "Munsalvatje" is pronounced "Munsalvatsch" in German, which is synonymous with "Wildenberg". Although some etymologies need to be verified, probably with Otto Springer, it is a quick exercise to google words like Montsalvage-Monsalvatge-Monsalvatje, which are quite common in Catalonia � and entirely independent of Wolfram and grail romance! Wolfram's change to Munsalvaesche (ms D used by Lachmann) may contain a higher symbolism: The umlaut ae cleanses "salvatsch" with the German "w�sche" (washing, cleaning, purification), a theme of the final rites when the black & white Feirefiss (son of fire) is baptized before the grail (P.817). In view of our findings, this connects to the macrocosm of the watery and fiery triangles in the sky. A good time to get help from the 2nd. century CE, which confirms the Magic Sword again: Claudius Ptolemy was a Greek who wrote the famous astronomical work Almagest, which is Latin for the Arabic الكتاب المجسطي, al-kitabu-l-mijisti, ( i.e. "The Great Book"). It was discovered in Toledo at the time of Chr�tien, and translated from Arabic into Latin by Gerard of Cremona (ca. 1114-1187). A better translation was done later under the patronage of Frederick II � when Michael Scot was his astrologer! Although it served the Vatican to oppose the heliocentric concept of Copernicus, it could be the "discarded manuscript" Wolfram's Kyot found in Toledo. For us, it is Chr�tien's second invitation to "grasp" the hilt of the Magic Sword, because Ptolemy was also a celebrated cartographer. When we pursue the "Greek connection" at the above cape, this erudite Greek rewards us with sensational news. Right where the Pyrenees meet the Med, there existed long ago a famous Temple of Venus, wich could have been consecrated to the love goddess Aphrodite in Greek times. The Renaissance editions of Ptolemy's maps display only this temple in all of Europe, which suggests it was more important than the one in Rome. 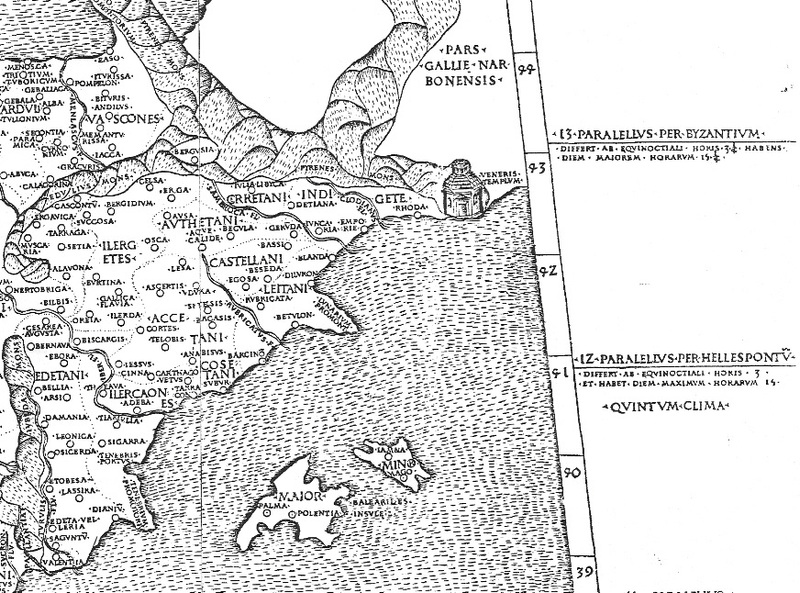 The collorized Bologna edition of 1477 includes it on the world map, like the Roma 1478 which has a larger image. Click on the detail at left and you'll see a larger picture in black & white! Below is the colorized German version (Ulm, 1486) which demonstrates the popularity of these maps in Europe. About a century before Ptolemy, the geographers Strabo and Pompius Mela mentioned the temple in their works, and Pliny the Elder in Naturalia Historia, which is conclusive proof of its importance. In view of our quest, this could give us a plausible explanation why Wolfram decided to name the grail keepers templeisen. Most scholars interpret it as a reference to the Knights Templar, but these knights were under holy orders within the folds of the Roman Church when Wolfram worked on his poem, and the accusations of heresy a later fabrication. In view of the above confirmation of a "Greek connection", Chr�tien's esoteric keys suggest that it should be a simple step to the grail itself. Our informant is a lawyer from Barcelona, Dr. Jeroni Pujades (1568 - ca.1650). His Cr�nica universal is based on fourty years of historical research, but disappeared under mysterious circumstances for two centuries after the first part was published in 1609 � which would explain why his findings are overlooked by most historians. Another reason is, unfortunately, that Pujades disputes the official chronicles of the Church and dares to challenge a part of medieval history the Bollandists and Maurists have pretty much nailed down. If you like the pun and are interested in Baroque intrigues, click on The Pujades Affair! It offers the kind of drama Alexandre Dumas could have written, with characters like Richelieu, Colbert, Louis XIV, the archbishop of Paris � and a touch of Cervantes to make it more entertaining. If you can't read the "Coronica" (1609) in Catalan, or the "Cr�nica" (1831) in Spanish, here are the highlights of this amazing tale: In the early 1600s, Pujades visited the Benedictine monastery Sant Pere de Rodes, where his son Dalmau was a monk. He discovered a book of parchments, numbered 223, in the sacristy of the main church  with a record of its history. It contains a story that was probably as much of a shock for him as it is a joy for us, not because we lack compassion but because it resolves an age-old mystery. Click here for the original Catalan account from 1609, or check the Spanish text (below) in his works, which was finally rediscovered and published in Barcelona in the 1830s . In the year 603, the pope and the citizens of Rome fear an attack by the Babylonians and Persians, and after a private council decide to take their holiest relics to a hiding place in the West. Pujades quotes other historians to show that the decision made sense, except that they could not foresee Rome would be spared and Jerusalem attacked instead � and many relics "profaned" including the holy cross. Hence, the pope leads a procession with the relics to a ship and after loading it is taken down the Tiber to the Mediterranean. As the ship sails westward, the glory of God and a good wind from the South takes it to Armen Roda, a natural harbor at the Pyrenees where the men decide to rest for a few days. Under the guidance of the churchmen Feliu, Pons and Epicino, they climb the mountains, enjoy the breathtaking views, and discover a cave near an artesian spring, with a small altar inside because St Paul of Narbonne had used it as a retreat in the first century. Impressed by the holiness of the place, the men decide to transfer the relics secretly to the cave, conceal the opening, and sail away. and a cup with the blood of Christ. Surprisingly, the naive tale about a "Ship of Fools" contains every basic ingredient of grail romance: There is the Holy Grail, which is in the �company� of St Peter the most venerated of fishermen. We have an hermit's cave near an artesian spring, which Wolfram features near the grail castle. And, above all, we meet some real fools with an elaborate "quest" on their hands. It will also take us a while to find out how "fishy" the legend really is! Our current revision is based on the conjecture that this could be the second Latin chronicle, as suggested by Wolfram's Kyot and the symbolism of Chr�tien's magic sword. Although Pujades relates the entire tale in Spanish, he may be giving his readers another clue by quoting the original text about St Paul's altar, which confirms that it is in Latin: "Et descendentes ab ipso monte, invenerunt fontem valde perspicuum, et ante ipsum montem invenerunt unam pulchriorem speluncam: et super ipsam unum parvum altare, quod beatus Paulus Narbonensis aedificaverat". In view of "Lancelot", this is probably another hint by the historian that he was aware of the grail connection, but couldn't reveal it openly. The Spanish Inquisition was still active and nothing could be published without their stamp of approval. That the men searched 'until their death' reveals they had failed. Hence, the search continued during the next generation � and who knows for how many more? According to Pujades, these men lived first in cells, or hermitages, a pious lifestyle Boniface IV had promoted. As the centuries passed, the cells grew to an abbey and monastery, high in the mountains above the Mediterranean. It was apparently not destroyed by the Moors and there is a tradition it was visited by Charlemagne. In those times the "green mountain" was covered by a lush rain forest, which was cut down in the 16th century to build ships for the conquest of the New World. (This picture was taken in 2007 when most of the exterior had been restored. For scale, just compare the small automobile at lower left. Here is also a link in English for a brief introduction to the site!) However, we have to be skeptical for several reasons: Latin chronicles can't be trusted and there is the problem that Chr�tien's grail is a platter or bowl, and Wolfram's lapsit exillis some kind of stone! To find the truth, we need to review the history and legends of Sant Pere de Rodes from different perspectives. For starters, the legend is great material for a Monty Python sketch: If Italian clergymen climb up and down these mountains for decades until they die of old age, intensely searching for something they can't find, the locals would have witnessed their odd behavior. Passing shepherds, hunters, and knights would have asked questions and the foreigners had to respond somehow. Simple and naive, as most early Christians were, they could neither be dishonest nor reveal the truth, which didn't leave many options. They would have admitted in Latin that they are looking for reliquiae insignes, some old bones, and a gradalis, a vessel without any value. Instead of revealing a search for the bones of Petrus, they would have mentioned a fisherman, and when pressed, a very special fisherman. Those who asked the right question, one of compassion, were welcomed and invited to join the quest. After all, the Italians needed new blood, disciples and servants who would work for them and continue after their death. Some of this lore was obviously embellished in nearby villages, where the men had to beg or barter for food and some novices talked too much. Soon, the rumors about an important fisherman included a "rich fisher" and perhaps even a "Fisherking". 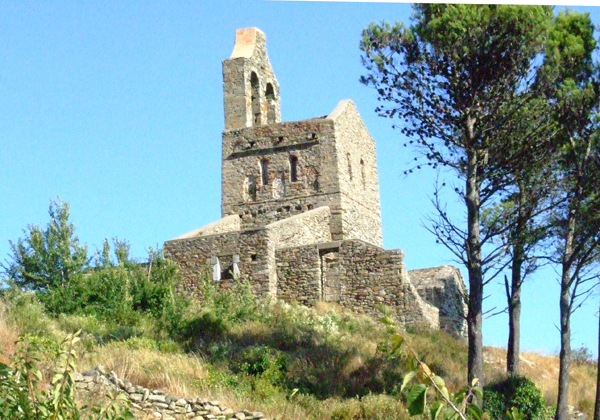 For decades, or centuries, the strange events at Sant Pere de Rodes and San Salvador was great stuff for passing minstrels, and some wrote it probably down. Who knows, they may have even named the cape "caput crucis" after the lost skull and crossbones? The seekers in the region between Roses and the Cape of Crosses became known as Rosicrucians and the stone masons lived in ther tiny village next to the monastery. It is named Santa Creu de Rodes, which is difficult to dismiss as a coincidence in view of the esoteric theme. This is a good time to pay homage to Alexandre Deulofeu i Torres (1903-1978), an amateur historian and philosopher in Figueres who provided the impetus for our grail study. He wrote the first guide book for the monastery in 1970, when it was still in ruins, and called it "Sant Pere de Roda" in Catalan. He introduces Pujades and the legend of the lost relics, from the skull and right arm of St Peter to the vessel with the blood of Christ. He even mentions the excavations of Peter's grave at the Vatican that came up empty! In disregard of traditional scholarship he proposes also that the 'adoptionist heresy' of Bishop Felix of Urgell included iconoclasm and influenced the Cathar faith. Furthermore, Deulofeu developed an impressive concept about the �matem�tica de la hist�ria�, a cyclical evolution of civilizations, which inspired our interest in the 854-year planetary cycles. 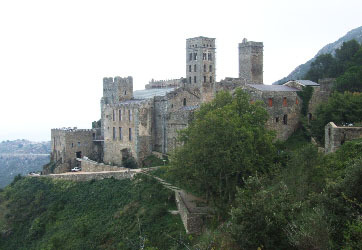 He even proposed that Romanesque Art was born at Sant Pere de Rodes, which could mean that Lombardian caftsmen were involved. This would support our hypothesis that the Freemasons originated there as well . The enlargement of the map identifies many famous churches and monasteries that were founded after Sant Pere and shows the routes of the travelling stone masons. Because they cover Western Europe and Great Britain over a period of several centuries, it may explain why they needed secret signals to recognize each other. Because the Rosicrucians seem to have had their start on the 'green mountain' as well, they were probably descendants of the original seekers and accepted by some masons as their spiritual guides. With so many grail symbols finally identified, we could ask why this article does not end here? Creative writers like Dan Brown and most filmmakers would wrap it up here and now! After all, we found the legends that started grail romance and why should it matter that the chronicle is a bit "fishy"? 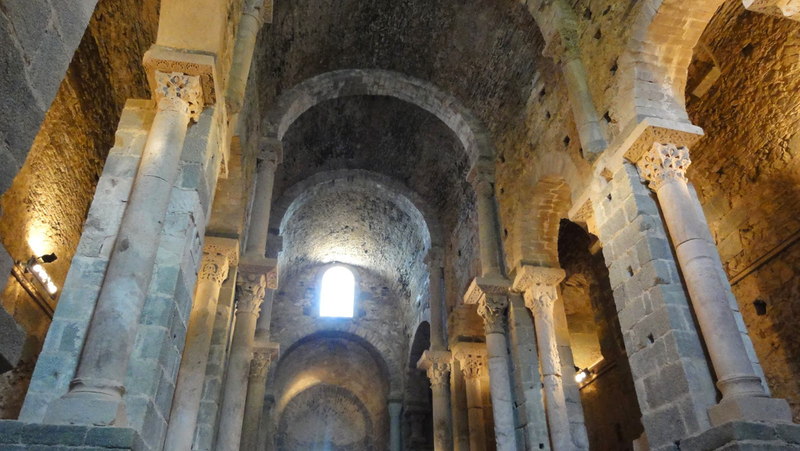 "Pasa mas adelante el dicho libro, y refiere que en aquel tiempo del papa Bonifacio cuarto, y del emperador Focas, fue construido aquel monasterio de San Pedro de Rodas: y que alli (debajo del altar mayor, como dije en el capitulo 16 del libro cuarto) reposan los cuerpos de San Pedro exorcista, hijo de San Pedro ap�stol, de Santa Concordia, de San Lucidino y de San Moderando. De modo que la cueva que hoy est� debajo del dicho altar, en la cual yo he entrado, seria la misma en que fueron puestas aquellas santas reliquias, por manos de Feliu, Pons y Epicino, que las trajeron de Roma. Y diciendose en aquel libro que cuando las trajeron estaban tambien con ellas las del ap�stol San Pedro; el no decir que estan ahora, arguye que debi� permitir nuestro Senor que en algun tiempo que se volviese a descubrir la cueva, y hallarse en ella las reliquias, dejarian alli las demas, y la cabeza y brazo de San Pedro lo volverian a Roma. Entendiendolo asi, no hallamos contrariedad en lo que sobre este particular dejamos aqui escrito, y lo que universalmente profesa la santa Iglesia catolica romana, diciendo que la cabeza del apostol San Pedro realmente esta en Roma, y alli se muestra junto con la de su socio y coapostol San Pablo. Y es muy posible que todo haya sucedido asi en diferentes tiempos".. If anyone had attacked his claim, which we'll explore with Robert's poem, he could have replied that he dated the events in 603 CE although most historian favor 608 (See note 5). And later, Pujades adds en passant that there are no records of Peter's relics having ever been returned to Rome � which he finds surprising because such an event would have been celebrated in all of Christendom. The discovery at Sant Pere de Rodes may have inspired Pujades to look for grail symbols at other monasteries in Catalonia, including Cuix� and Montserrat, where he is our key informant as well. Here's a interesting exercise with Google Earth: Put a marker on Ta�ll, Cuix� and Monserrat and you'll get an equilateral triangle because they are almost 80 miles from each other! This inspired us to imagine that Chr�tien de Troyes visited Sant Climent de Ta�ll and meditated in front of the altar and noticed St Mary's sealed lips and the red-hot flames of the bowl in her hand. A poet of his caliber could easily envision Plato's "mixing bowl of life" and the route "per-ce-val" of Val d'Aran to Cuix� and create a "Conte du Graal". Or turn 60 degrees to the left and take La Vall de Santa Creu up to Sant Pere de Rodes and explore other levels of the mystery! Perhaps, we'll find an esoteric Latin tract by Pujades about Mont Verdera which inspired the German Rosicrucian manifestos because the similarities are difficult to ignore. It was an era when scholars had no language barriers because they communicated in Latin, like Kepler and Galileo, for example. Although highly speculative, we can't exclude the possibility that Pujades was regarded by some initiates as a master of their order . It could explain why he was neither censured nor punished when his polemic debate of Peter's relics was published in 1609. Unless, of course, it took his foes 26 years to decode his esoteric concept and had him suffer the ultimate penalty in 1635. This writer checked the cave under the altar in the late 1970's when the monastery was still in ruins and noticed that the entry looks like natural rock, but that some fine masonry cuts betray the scam: It is man-made! Later excavations and restorations opened to a small crypt with no signs of a cave and which tourists can enter today. This is strong evidence that the cave was never found and exposes the inconvenient truth that this spectacular monastery was either built on lies, or the cover-up invented later. In a new twist, the cave is now suspected under the main tower, but according to a local legend, it leads all the way down to the Med, which further discredits the story of the lost relics. We'll have to wait and see what the archeologists are holding back and what they come up with next. Let's keep Chr�tien's clues in mind: The truth may be hidden under a Venetian sheath or scabbard. Did Alexander III use the "Peace of Venice" to have his monks rewrite history? The ruins are only visible since the 1980's because they were hidden by trees and bushes until a couple of major fires opened the above perspective. It is common knowledge among the locals that the fires are set by shepherds to preserve open spaces for their herds. In the 1970's, when this writer lived in a village at the Muga river and had a clear view of this mountain top, he kept searching for the grail castle elsewhere, like a fool. (I never saw these walls, didn't even know San Salvador existed until I read in a German tourist guide, of all places, about a legend that the Holy Grail was once guarded at the monastery. I visited Sant Pere de Rodes when it was still known as St Pere de Roda and read about Pujades in Deulofeu's guidebook when all pieces of the puzzle came finally together . 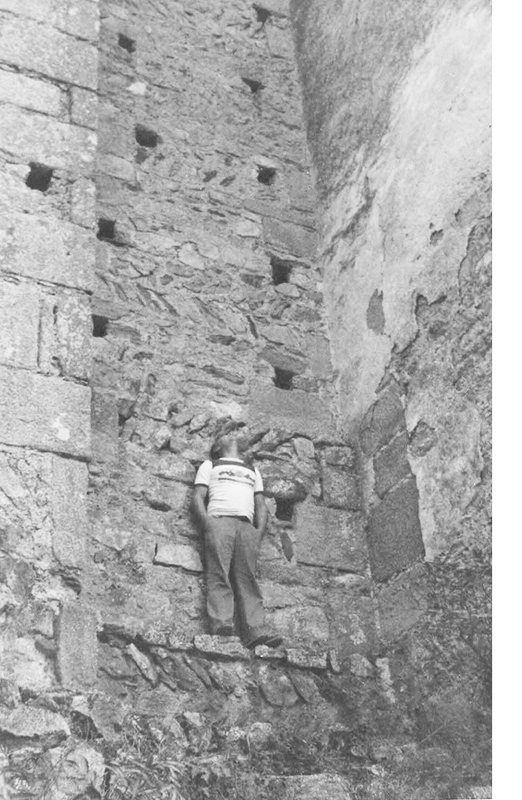 My wife took the above picture of me in the early 1980s to document the large stone blocks that were used in the Middle Ages). Everywhere inside the church were these blocks used to support the columns, as the photo at right demonstrates. The archeologists would be well-advised to compare them with the authentic Roman blocks at left we photographed on a street in Rome! They have been outdoors for about two thousand years and, except for a rounded corner, are practically identical! Wikipedias are not always reliable because anyone can edit the text, monks included, but it is curious that our conjectures from the early 1980s have finally some support from this version in English from 2015, where it is claimed "Columns and pillars have been taken from a former Roman building"! Another guidebook is "DK Eyewitness Travel: Barcelona and Catalonia" at right, revised in 2008! 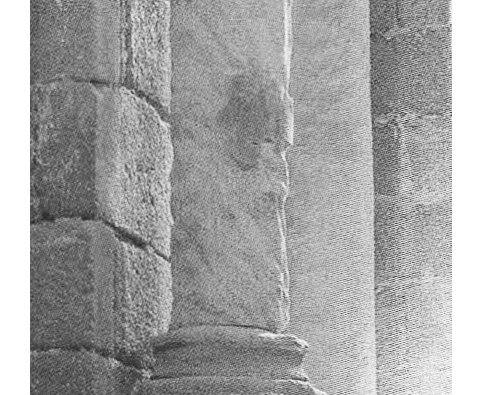 Although pillars and columns are often confused, that they are from a Roman temple makes sense because they seem to be marked by the fierce Tramuntana like the rocks at the Cape of Crosses, which is inconsistent with their location inside a building. 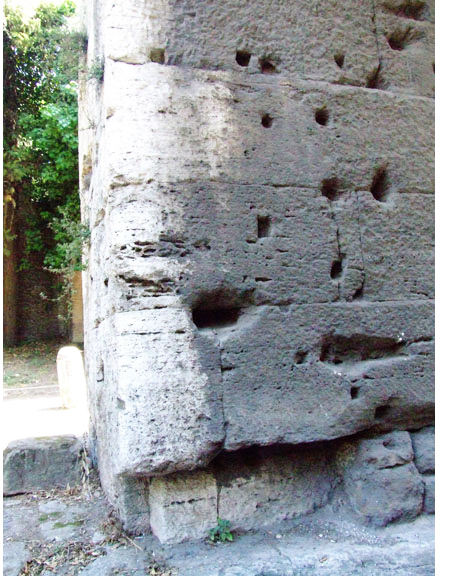 The photo from the 2002 guidebook at left shows that columns of different lengths are pieced together. We removed the colorful light effects from our scan to enhance the marks of the weather. In fact, the Corinthian capitals could also be from the temple, but that's something only an art historian can determine. With such conclusive evidence about the pillars and columns, it is difficult to understand why Catalan archeologist are keeping quiet that the Venus temple has finally been discovered, even though it is established that Christian churches were often built on top of Pagan temples. and regard the dove as the sacred animal of Aphrodite. We are reminded of the above love letter where Wolfram mentions the Tramuntana, which makes the love theme additional evidence that he visited the site. Some sculptures from the love temple could have been used for the monastery, but little evidence remains. The monastery has been sacked and pillaged for centuries, and anything of value has been removed by bandits, pirates, treasure hunters, and soldiers with hammers and chisels. 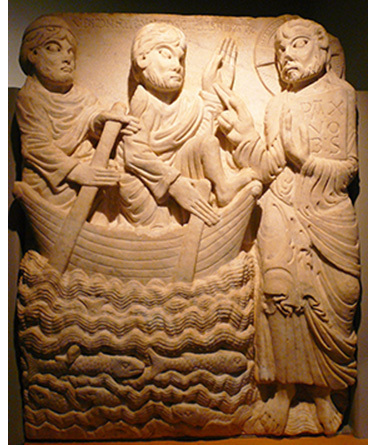 Some fragments have been identified in museums around the world and collections in Catalonia. There is "Peter in the Ship", a relief with carvings from Antiquity on the back, and two windows in the main tower with sculptures of a mermaid and a bearded man. Did Wolfram take them for Aphrodite and Aphroditos? The Corinthian theme and medieval foliage depicted on the capitals would explain why Ishtar-Aphrodite-Venus became a major theme in latter-day romance, from the vegetation cults to Venusberg variations. As said above, the Tramuntana opens the Chymical Wedding and in addition to the triangular "Tomb of Venus" where her son Cupid appears in the tale, there are "Three Temples" on the mountain top that form one of the many triangles the tale features. If you understand German, here is an informative summary by the Anthroposophical Society! 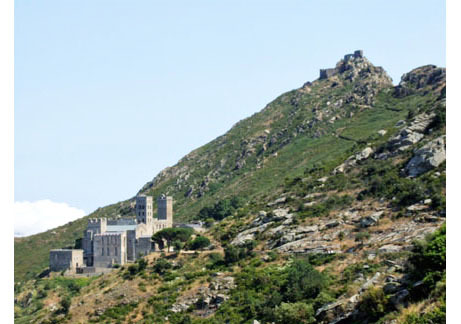 The fortress San Salvador, the monastery Sant Pere, and the church Santa Helena are grouped in a triangle on top of Mount Verdera, high above the sea where the Temple of Venus once stood. The site is between the town of Roses and the Cape of Crosses, and the builders of the abbey lived in a nearby cluster of buildings called Santa Creu de Roses, which indicates that they became known as "Rosicrucians." In addition to Wolfram, other poets may have visited the site as well and came up with creative ideas. Even the Celtic symbolism in grail romance could be based on the region because it was once settled by the Celt-Iberians. Few outsiders know that the Pyrenees are packed with spectacular "dolmens" and "taulas" of pre-historic times! When you check Google Earth for the dimensions of the cloister, use the Geo view and click on the photographs near St Pere de Rodes of dolmens. You can also enjoy this paraglider which begins above the Greek ruins in Emp�ries and ends with some gutsy passes of the monastery! This is spectacular YouTube footage from a drone that circles around Mont Verdera! 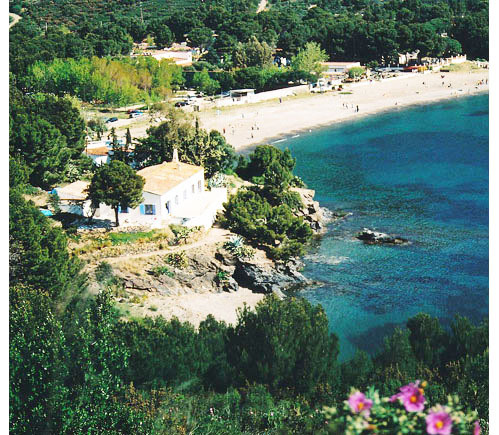 We can see Roses at the bay, several views of Port de la Selva, and a little of Llanc� below. The wide-angle lens distorts the horizon and makes the ancient harbor Emp�ries at the end of the bay seem farther than it is. As this was recorded on a warm day shortly before sunset there is substantial haze in the West where Olot and the Pyrenees are usually visible. Source for the information is the art historian Imma Lor�s i Otzet who teaches in Lleida and Barcelona . According to her detailed report, the archeologists at the site identified a structure of 25 x 7 meters from the "Roman era," which is East of it and in a North-South orientation. They also uncovered under the 12th century cloister a primitive one, which lines up with the Roman structure, which had been used as living quarters until the end of the 17th century. Furthermore, they finally admit that the pillars and columns inside the church are also from Antiquity. Here is another picture to illustrate what we suspected for decades. We can see where the columns are pieced together and covered by a smooth layer of stucco which has largely deteriorated. What we don't know is where they came from? But it makes no sense that the beautiful capitals are a mix of unrelated designs unless the Romanesque capitals were combined with their Corinthian counterparts from the Venus temple. Based on the entertaining idea that if something walks like a duck... it seems strange that the archeologists hold this conclusion back! It could mean that they can't rule out that the fortress on the mountain top was built on the temple's foundations, which would require further study. In that case, the lower structure served for housing and the columns were rolled down the mountain and broke apart en route. The guidebook offers a floorpan of the monastery, which identifies the Roman structure at the right of its plan under 18 "Remains of a building predating the abbey..." which may be the dark walls parallel to the blue roof at the right on our photo, although they could be hidden under a roof if they were covered until the 17th century. Deulofeu mentions in the first guidebock  a structure in the South, measuring 21.5 by 6.05 m and built in "opus spicatum," which he believes is "perhaps even older than the monastery." 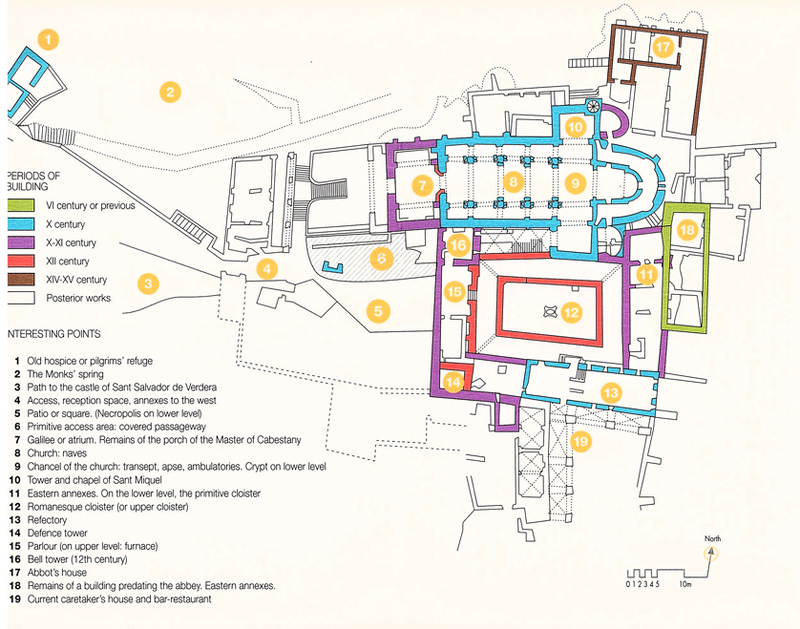 According to the layout, all spaces around the upper cloister (11-16) are quite similar to the Roman structure. Hence, there is a good possibility, pending excavations of the foundations, that they relate to the temple. Although the older picture of the South-Eastern side (below) shows a fairly well-maintained landscape, the archeologists seem to have let the growth of bushes and vines get out of hand to prevent public access of the Roman walls if they are outside the monastery. We tried in vain last year and intend to document our next attempt in the summer of 2018. Lor�s points out that some kind of earth movement had caused a crack in the Southern wall of the Roman structure and exposed materials from the inside that can be dated from the 6th century. Even this evaluation can be supported with the research of Pujades, who quotes from several historians that devastating earthquakes errupted in France and continued into Spain around 584 CE, causing major destructions in the Pyrenees , which could have included the Venus temple. According to Lor�s some fragments from Antiquity were found at the site, including one of Carrara marble with vegetation motifs from the 1st century CE . 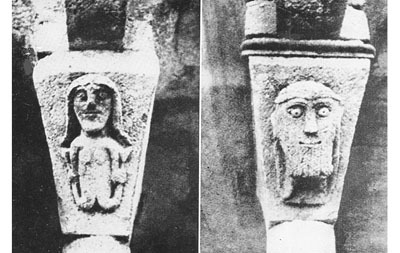 This could be a reference to the agrarian cults and Venus symbolism we mentioned above and might explain why so many capitals from the 10-12th century repeat the theme in other Romanesque cloisters and churches in Catalonia. 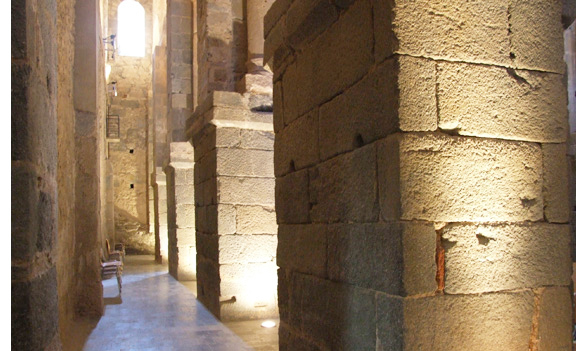 Pujades mentions two large blocks of Italian marble that were used as altars, which are no longer extant. Based on his observations at the site, he had good reasons to propose that the events in the legend could have taken place earlier than 610 CE, as the earthquake indicates. Especially, if we consider he had a "mole" there because his son Dalmau was a monk who transferred from Cuix� to Sant Pere and could have shown him the Roman ruins! Nevertheless, most scholars will dismiss these legends if there is no external evidence to support them, but we will show below that Peter's skull and crossbones are indeed missing from his tomb at the Vatican! Because this is an established fact, published in an official report of the Vatican, the legends of Sant Pere de Rodes are difficult to ignore! If relics were lost in a cave, which the poor fools had to search for until the end of their life, it was obviously not next to Roman ruins and an Artesian spring! It was merely the ideal location for a shelter during the search as it is hidden in a dense rain forest in the mountains. According to Pujades, the monastery was discussed during a Vatican council which gave it special privileges of the "patrimony" of St Peter, matching those of Rome. Modern sources credit pope Urban II, who launched the Crusades, and that many papal bulls in favour of the monastery attracted pilgrims and donations that made it rich and famous. This happens to coincide with the works of Chr�tien and Wolfgram, which supports the possibility of a cover-up by pope Alexander III. Perfect timing in a way because the monks of Glastonbury claimed falsely in 1184 to have discovered the graves of King Arthur and Queen Guinevere to raise some funds! 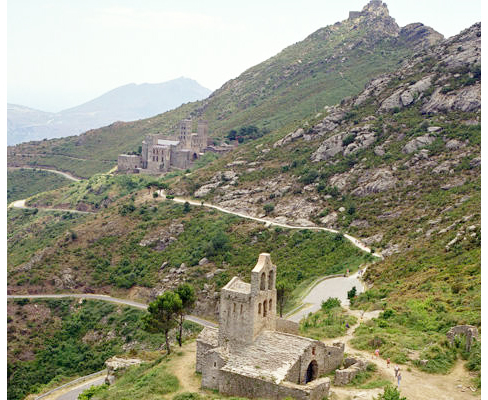 But how would the legend of Sant Pere de Rodes fit into such a scheme? The monastery was expanded dramatically when the relics cult was at its peak, when entire churches and cathedrals were built upon fragments of bones, and even foreskins. Its legend, however, is about Peter's entire skull and right arm, paired with a blood relic of Christ, which would be the most treasured relics of Christendom and far too holy for monks to simple make up! What they could have invented, which is also suggested by Pujades, is that the relics were not lost in 603 CE, but at an earlier time if we consider the Roman structure. If the chronicler changed merely the timing of the event, the relics could have been removed from Rome shortly before the Visigoths sacked the city in 410 CE. This way, the scenario would remain unchanged and the ship's voyage towards Hispania would make a lot more sense because Roman provinces were well-established and more secure than Rome at the time. What doesn't seem to fit in this version is that Peter's tomb would have remained empty for sixteen centuries! � because they really didn't know where it is! 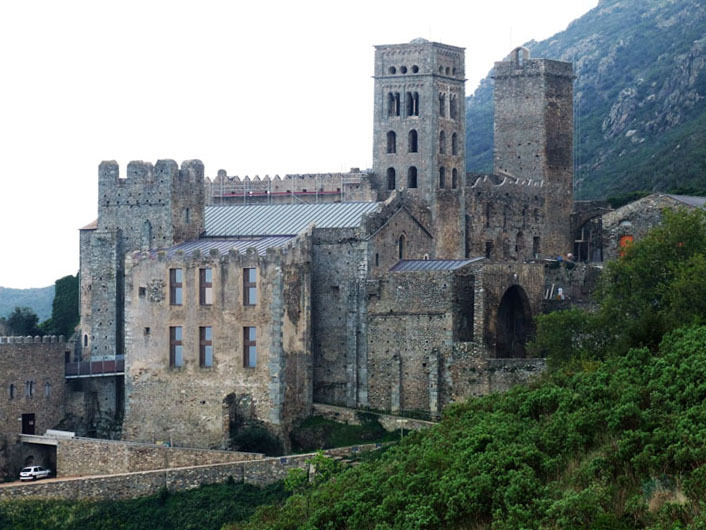 This scenario makes the legend of Sant Pere de Rodes almost believable. It would explain why the search lasted for centuries and why funds were available to build such a large monastery. It could even involve Pietro I Orseolo (928�987), a powerful doge of Venice who may have come to the region to become a monk and search for treasure! 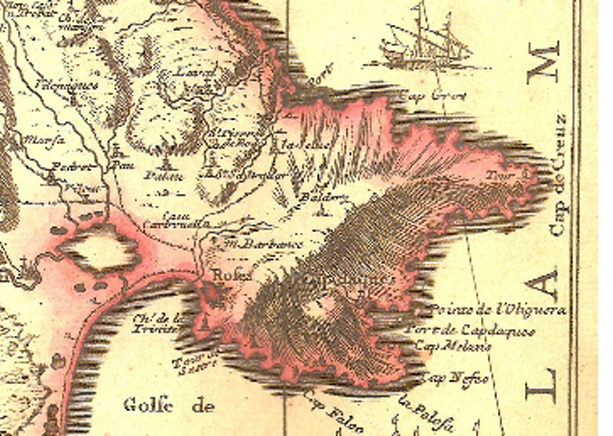 Robert de Boron's estoire would become credible about three successive parties travelling to the farthest West. The first group of Alan warriors could have hidden the treasure, and not in Avalon, which is in the North, but in the valleys of Avaron, Catalonia. We must go per-ce-val to find it, which may be why Chr�tien calls Perceval a Valois and Wolfram uses Waleise � because he went through a certain "valley" to reach his destination and destiny! This has confused many scholars who failed to consider the wordplay Val Avaron/Val Aran because Val d'Aran means "valley of valleys" and leads through the valleys with the fiery grails to the valley of Llanc�. The second group is all about the Vatican and Petrus, but the seekers gave up the search when they realized that spiritual ideals are more valuable than material objects, which would identify Robert's third group. This means that the treasure was hidden at Mount Verdera and would explain why Robert suggests that the riddle of Petrus could reveal "what became of him, where he would be found again, and that he can only be rediscovered with great hardship!" 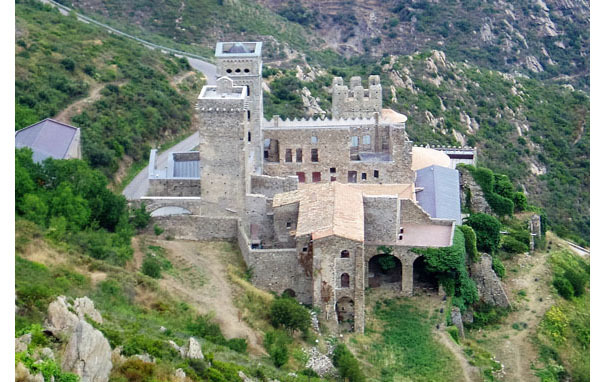 If we review the above study of Sant Pere de Rodes, which has been stitched together and revised over decades, it becomes clear that Chretien based his grail castle on Sant Miquel de Cuix� and Wolfram on Sant Pere de Rodes . We can also conclude that the cave with the relics has never been found and is covered by a landslide on or near this mountain. Scholars, who may have visited our site over time, got probably the idea to release inconclusive bits of information about the Roman structure, so they can claim they have said all along that the famous "Venus Temple" has been found! Until the cave has been recovered, they may be holding back most information to keep treasure hunters away because it is likely to have more that a few bones and a vessel. Finally, we need to consider that the origins of the grail mystery have finally been identified and that we have reached important "crossroads", pun intended. You have the option to either research some "spiritual values" in the Pyrenees near Urgell, or "material things" at the Vatican to check if Peter's relics are missing � and then review Robert's riddle to see if valuable artifacts from the Sack of Rome ended up in the lost cave. Or you can start from 'scratch', literally, to find out why Kepler illustrated the title page of De stella nova with a vignette of ten chicks scratching in the fertile dung of a farmyard? Could this relate to his claim there may be a seed of truth or "golden corn" in superstitious beliefs? 1. We propose under Wolfram in Grail Riddles that it means "anschauen" in German, like "looking" at something. If you don't mind getting even more side-tracked, here is our on-going study of The Kyot Problem. 2. See prologue at end of article, lines 13-19. 4. Wolfram von Eschenbach, Parzival, tr. A.T. Hatto, (New York, 1980), p.356. However, the translation of Cyril Edwards, Parzival and Titurel, (Oxford, 2006) mentions in Explanatory Note 299, p. 392, that Tremuntane is "a borrowing from the O.Fr. tresmontane, 'North Star, Polar Star', or perhaps Italinan tramontana. In a crusading lyric of Wolfram's contemporary, Der Tannh�user, it denotes the North Wind." We should add that he was a generation later, but may have met Wolfram as the Venusberg legend implies. 5. Geronimo Pujades, Cr�nica Universal del Principado de Catalu�a, (Barcelona, 1829), p. V? 7. Alexandre Deulofeu, El Ampurd�n, cuna del arte rom�nico, (Barcelona, 1962). See also: Kenneth J. Conant, Carolingian and Romanesque Architecture 800 to 1200, (Yale University, 1992), p.102. "The Lombards, aggressors against Rome and Montecassino, are generally thought of as destroyers. However, they had a fairly well organized state... After their conquest (774) the Franks used these cadres, and they aided in the task of setting up Charlemagne's empire". 8. Anna Perez i Mir, Catalunya romanica, 11., (Barcelona, 2000), pp.738-39. 9. Alexandre Deulofeu, Sant Pere de Roda, (Figueres, 1970). 12. 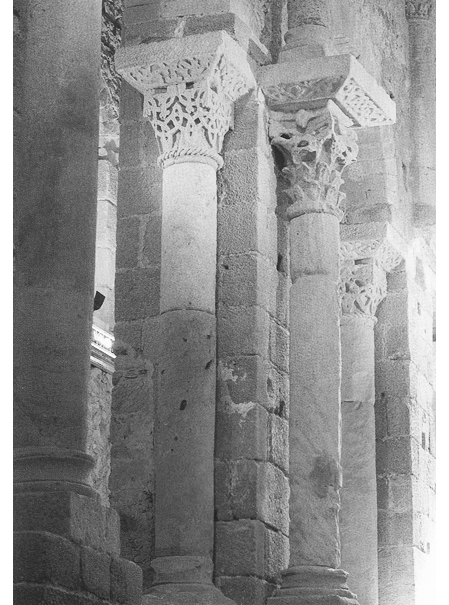 Immaculada Lor�s, El Monestir De Sant Pere De Rodes, (Barcelona, 2002), p.19-20: Here's the link in Catalan to Estructiones d'�poca m�s antiga: Dos murs paral-lels i molt regulars, constru�ts amb grans carreus rectangulars de granit que constructivament difereixen de la resta de construccions del monastir, delimiten un gran edifici rectangular, de 25 x 7 m, l'aparell del qual va fer pensar que es tractava d'una edificaci� d'epoca romana (Matar� i Pladelasala 1992: 35, Matar� et al. 1992-1993: 149; Burch et al. 1994: 166; Matar� i Riu i Barrera 1994: 81)... Tamb� es va poder comprovar de l'edifici estigu� en �s com a m�nim fins al segle XVII, moment en qu� as va eixamplar cap a llevant, segurament a causa d'algun moviment de terra que ses va afectar i del qual encara en queda una esquerda en el mur sud. Els materials trobats en els dos estrats inferiors que recolzaven sobre la part interior dels murs s'han datat en el segle VI, la qual cosa informa que la cronologia de l'edifici ha de ser contempor�nia o anterior i, per tant, tardoromana (Llin�s et al. 1996: 272-273; Matar� i Pladelasala 1999), cosa que rectifica suposicions precedents a la intervenci� d'una dataci� anterior (Matar� i Pladelasala 1992: 35; Matar� et al. 1992-1993: 149). Del que no se'n pot deduir res �s de la seva funci� original. De tota manera, la immillorable situati� estrat�gica de l'indret fa perfectament plausible suposar-hi un empla�ament antic..
15. Lor�s (see above, Nr. 11), p. 20. A close examination of Google Earth Pro shows a number of landslides around Mont Verdera which could have covered the cave. We should also consider that part of the mountain top could have broken off during the quakes as the rubble below suggests. 16. Our study of Chr�tien proposes that he based the "Conte du Gral" on the Gesta comitum... and its hero Perceval on Guifr� el Pel�s. A comparison of his poem with Wolfram's adaptation shows that Chr�tien used the monastery Eixalada (now Cuix�) as model of the grail castle, with the Fisherking fishing on a river because there is no lake. It is the river Tet, which destroyed the ancient monastery and required that Cuix� was rebuilt on higher grounds. 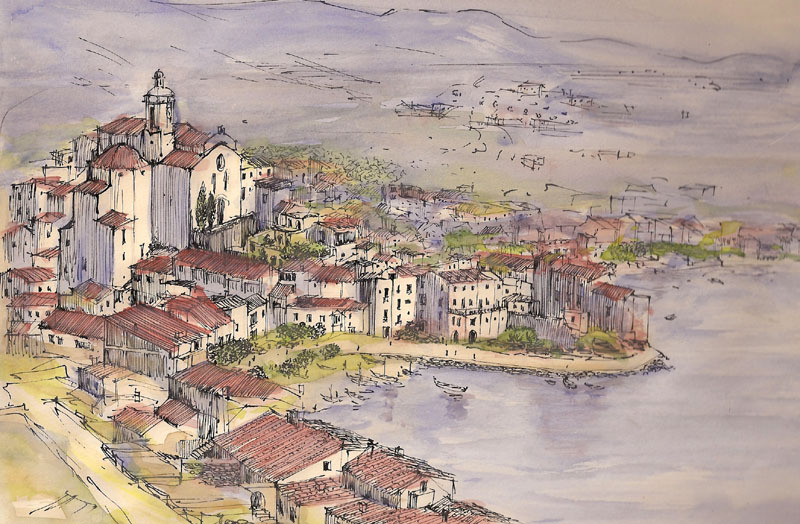 Wolfram fuses Sant Pere de Rodes with the VenusTemple and supports this by introducing Anfortas fishing on a lake to which the monastery had the fishing rights. The region was a Greek colony and the Greek name of the monastery allows him to expand Chr�tien's concept with the help of Plato and Plutarch and invoke Aphrodite and the phoenix myth.